A while ago I was fortunate to find a piece of unusual BCal memorabilia, and it gave rise to the idea for this page. 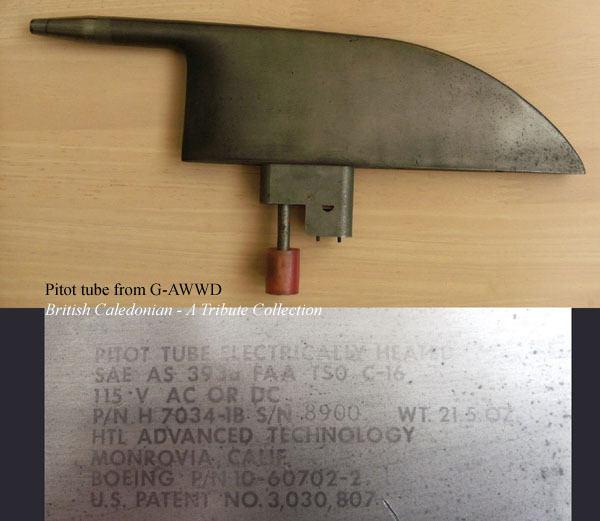 I happened across a Pitot tube, from a Boeing 707, this particular 707 was both ex-Caledonian and ex-British Caledonian, G-AWWD. It got me thinking about Whisky Delta, and the history of this aircraft, where she had been and what she had done while in service with the Lion Rampant on her tail. So here follows some of the highlights of her years in service. Anyway, back to the Pitot tube to start with. The Pitot tube is mounted on the outside of the fuselage in the airstream and used to measure air pressure, and by comparing this to a static pressure, it is possible to derive the aircraft’s air speed. Being outside in the airstream at high altitude, they could freeze up, so they have a heater to prevent this. There are two pitot tubes, one either side of the fuselage, and these are mounted below the cockpit on a 707. So if one becomes faulty there is a second one still in service. The one shown here is G-AWWD’s starboard Pitot tube. It was removed in Buenos Aires, Argentina, as the heater had become faulty. A new one was borrowed from Lufthansa and flown across South America from Santiago, Chile. The work was undertaken on 21st June 1974. So we know Whisky Delta flew the long-haul routes to South America. Okay, back to the very beginning. Boeing 707, construction number 19355, made her first flight in 1966 and entered service with US carrier Flying Tigers in February 1967 as N325F, she then headed off for a lease to Israel’s El Al in 1968. Late on in 1968 she joined the Caledonian Airways fleet. G-AWWD was a convertible 707-349C, so could be configured for passenger or freighter use and she had a large freight door to allow main deck cargo to be carried. It was Engineering’s task to configure the aircraft for service and they had the job of removing / refitting the aircraft’s cabin seating, panels, overhead lockers and galleys. Not too long after entering service, WD was the first 707 ever to attend the Biggin Hill Air Show in May 1969. It was a quick visit, a fly past flown by Captain George Bellamy; WD flew along the runway, just 50ft off the ground, before heading to Prestwick. No passengers on board for this one, it was a positioning flight. 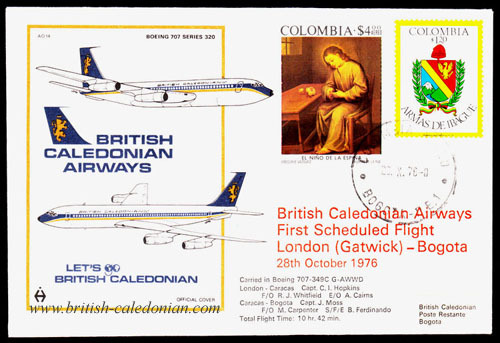 After being re-liveried into Caledonian//BUA titles following the merger between Caledonian and British United, WD was off to Santiago in November 1970. This time there were 162,000 small passengers on board. They were all one-day old chicks to help increase poultry production in Chile. As well as the usual cabin configuration changes for this cargo flight, the air conditioning had to be altered to cope with the extra heat generated by all the chicks. We next find WD starring in a television commercial for BCal’s new scheduled transatlantic services. She was busy being filmed at Gatwick in January 1973, first emerging from a hangar, taxiing and taking-off, all with the Let’s Go British Caledonian jingle playing over her appearance. So it was fitting, having helped promote the new US services, that Whisky Delta, was the aircraft chosen to fly BCal’s inaugural service to New York on 1st April 1973. Onboard were many invited guests including Mountbatten. They all got to enjoy the newly refurbished cabin onboard; WD had been fitted with a new wide-look interior for her transatlantic services. Though BCal's scheduled transatlantic services did not last long, the 707 fleet was kept busy with increased transatlantic charters and of course cargo flights. As an inaugural services veteran, WD departed for Bogota via Caracas in October 1976 flying the first BCal scheduled service to Colombia in South America. The arrival of the DC10s in 1977 saw two 707s sold, but G-AWWD continued in service and she was soon engaged flying some of the children helped by the Golden Lion Children’s Trust. WD was off to Le Touquet in June 1977, the flight time was just over 20 minutes, and the kids had a day out in France. With plans to add more DC10’s to the fleet, a number of 707s were to be sold, and this time G-AWWD was to be one of them. 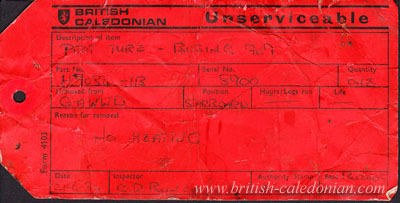 She changed owners on St. Andrews Day, 30th November 1977 and headed off to Angola Airlines. 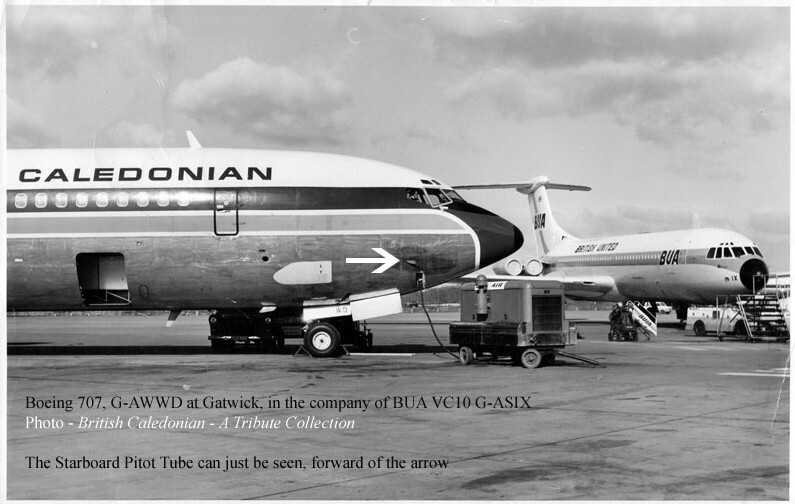 G-AWWD was re-registered D2-TAD, then later D2-TOC and finally D2-TOJ. She continued in service with Angola Airlines until 20th February 1992 when she suffered a nose-gear failure while taxiing and was written off; now beyond economic repair. The crew of four on this cargo charter all escaped without injury. I am certain that over the 26 years of service this 707 dutifully provided, she had flown the equivalent of hundreds of times around the world, while carrying countless passengers and huge quantities of cargo, all this and still finding the time to star in a TV commercial too! In 1976, when I was BCAL’s Manager in Seychelles G-AWWD routed via SEZ en route from EBB to HKG with a cargo of Baby Elephants. The aircraft landed in SEZ for refuelling and importantly for watering the elephants who were quite thirsty after the heat of EBB. This caused quite a bit of interest locally and the Seychelles Gazette carried the headline caption the following day – “BCAL lands first JUMBO in the Seychelles”. At that time BA were also operating to SEZ and the local BA Manager was not amused at the time with the press implication that BCAL had landed the first Jumbo jet, until he actually read the article.